A group of SLAC physicists and engineers celebrate the handover of the ILC Technical Design Report. 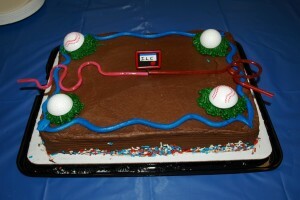 TDR handover party cake, complete with silly straw model of the ILC. Image: Cherrill Spencer. The University of Tokyo, CERN and Fermilab weren’t the only locations celebrating the handover of the International Linear Collider’s (ILC) Technical Design Report on 12 June. SLAC employees who have worked on the ILC had a party of their own: the group watched a live stream of the American event and enjoyed a cake topped with an ILC made from silly straws. Around 35 SLAC employees gathered to watch the handover of the Technical Design Report (TDR) from ILC’s Global Design Effort Director Barry Barish to International Committee for Future Accelerators (ICFA) Chair Pierre Oddone at Fermilab. Many also tuned in early for a presentation on the 25-year history of electron-positron colliders by SLAC physicist Nan Phinney. SLAC magnet engineer Cherrill Spencer organised the party, which was held in SLAC’s new Research Support Building that houses the Accelerator Directorate. She wanted to provide an opportunity for those who had worked on the ILC to celebrate the fruit of their labours. 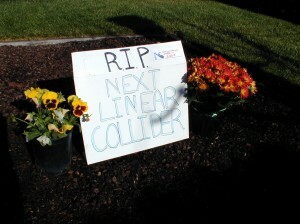 “There are a lot of us here who spent half our lifetimes working on linear colliders,” Spencer said. Party attendees included SLAC engineers, staff scientists and accelerator physicists who designed ILC equipment, created prototypes and assessed costs of beamline components. SLAC theoretical physicists who worked on determining parameters such as beam energy were also part of the group. One of the partygoers was Tom Markiewicz, SLAC’s representative on the ILC Machine Detector Interface (MDI) Common Task Group. The MDI group’s work has involved the engineering of the push-pull detector system and the focusing and delivery of the beams to the collision point. Spencer found satisfaction in seeing a completed TDR. Her own work on the ILC includes designing and costing over 13,000 magnets. Most recently, she helped with the redesign and re-costing of magnets for the ILC’s damping rings. The TDR handover party isn’t the first linear-collider-related party Spencer has planned. In September 2004, Spencer hosted a “Goodbye NLC” party in the back garden of her Palo Alto home after SLAC’s design for a linear accelerator was set aside in favor of DESY’s TESLA design. SLAC’s Next Linear Collider (NLC) design involved copper-based cavities and a room-temperature, or “warm,” radiofrequency power delivery system. DESY’s TESLA design proposed the cold superconducting technology that will be used by the ILC. When ICFA selected this design for the ILC, SLAC physicists, like Markiewicz and Spencer, moved from working on their NLC design to the new ILC design. Spencer’s backyard in 2004 after burial of the NLC memorabilia. Image: Cherrill Spencer. 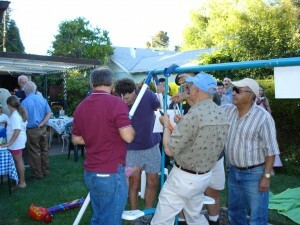 To find closure after the switch, Spencer led 25 other physicists and engineers in the “Goodbye NLC” party, which, besides food and drink, involved taking apart an old swing set labeled to represent the NLC, as well as digging a hole to bury NLC-related items. After taking apart the swing set, Spencer, her SLAC colleagues and their families dug a hole where the swing set had been and buried a box of NLC memorabilia. Diagrams of the linac, a 1996 Snowmass Report on the NLC and a pulse-forming network coil strap remain buried beneath her lawn to this day. “I’m a person who believes in celebrating when there’s something to celebrate and bringing closure when we’ve been disappointed,” Spencer said of the two parties. Though the NLC party was a “goodbye” party, Markiewicz said the TDR handover party could be considered a beginning party. “We’re hoping that with this handover of the TDR, the Japanese will have the technical basis they need to make a solid proposal to build the ILC to their government,” he said.